The computing landscapes of enterprises are experiencing a significant change through virtualization and cloud computing. This is increasing the complexities of sustaining and maintaining these landscapes. The ease by which virtual servers can be created or cloned has moved the problem of “server sprawling” from the hardware level to the virtualization level. Resource limitations imposed are only driven by the actual server hardware capacity. Adding cloud computing to the equation, which proposes computing as utility and postulates theoretically unlimited resource access, expands the server-sprawling problem. Today it is not unusual for IT to add hardware or software resources in flight without disruption of services to the business. Not only that, but virtual servers can be temporarily moved to different data centres to take advantage of better pricing models. Should a business process experience degradation in performance, virtualization allows resources to be added to address the temporary bottleneck. BDIM encompasses a variety of different areas. First is the requirement to provide a monitoring infrastructure that is able to gather measurements, and store them in a central data store. This infrastructure must be vendor agnostic and must allow for the collection of measurements from all different technologies, applications, and business processes. These measurements provide the data that enables companies to discover relationships and patterns related to business process performance, IT service level performance, and hardware and software performance. In addition, the organization must provide the capability to assess these measurements and establish and refine metrics and KPIs (key performance indicators). Second is the requirement to be able to mine this data for potential patterns of interest. Such mining could result in discovering connections between different business process activities as well as bottlenecks in processes from a hardware/software side or procedural side. Mining process data will also provide understanding and insight into business process compliance issues that would not otherwise be discovered. Business process compliance examines how closely the executed process adheres to the designed process and detects deviations between design and execution. Third is the requirement to establish and identify relationships between IT service metrics and business process metrics, in order to determine the value contribution of various IT service components to the overall value generation of a business process. Each of the above-mentioned areas is in itself a research area. Thus the scope of BDIM is significant, given that it involves a variety of disciplines and requires considerable expertise to establish a pragmatic usefulness for enterprises. In designing enterprise architectures, no consideration or allowance is given to integrate an overall monitoring environment to collect metrics from various applications, technologies, and business processes. Organizations are dealing with heterogeneous environments at the hardware, database, and application layers. Some applications are developed in house whereas others are purchased (such as ERP, CRM, and SRM systems) and others again are outsourced or cloud-based. There is no common standard of metrics collection across such diverse landscapes. Monitoring and alerting have only an operational focus to ensure that IT components are functioning and performing. Furthermore, monitoring tools are specific to the application area or problem. Besides a fragmented implementation of such tools, this also fosters application silos. As a consequence, most monitoring applications do not communicate with each other. The situation of monitoring and alerting within IT is reminiscent of the fragmentation and disjointed implementation and development of interfaces in the late ‘90s. Interface architecture followed a point-to-point pattern and was the cause of an overall “interface hairball” until this was addressed with integration platforms, an enterprise services bus, and service-oriented architectures. The driving force of change was the introduction of integration patterns and integration architectures that bridged heterogeneous applications. In the same way, enterprise monitoring and alerting needs to become a discipline within enterprise architecture design and development. The objective should not be focused solely on operational tasks of notification and resource assessment: the primary objective should be in collecting data, metrics, and KPIs to measure IT’s contribution in generating business value. 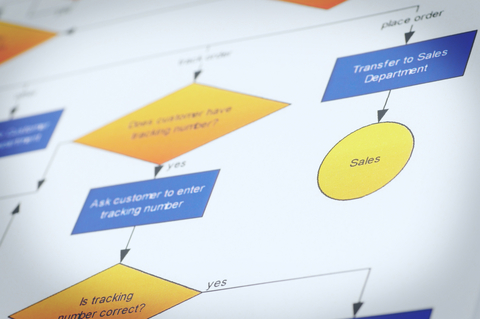 Over the next couple of months, we will be further investigating business process monitoring and process mining. We will discuss its advantages and how data mining algorithms can be used to extract interesting process-related behaviours. This information can then be used to further improve the steps in business processes and achieve a higher degree of optimization. Sauvé, J., Moura, A., Sampaio, M., Jornada, J., & Radziuk, E. (2006, April). An introductory overview and survey of business-driven IT management, at The 1st IEEE/IFIP International Workshop on Business-Driven IT Management (vol. 1, pp.1–10). Vancouver: IEEE Communications Society.